On the cover, I stamped two of the smaller flowers with pigment ink, colored them with blush and olive markers, and then I used a texture tool to add depth. The cardstock is from the Flirty paper packet, and the ribbon is color ready seam binding. The stamp is from a special Consultant set, and I thought the saying was perfect. I always like to hear what my team members are dreaming about! Now let's take a look at the inside. 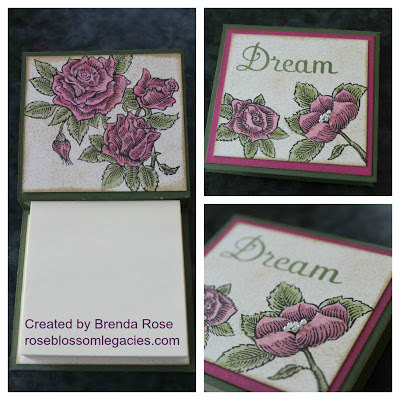 I stamped the inside cover with the large rose bouquet from the Stamp of the Month, and I did the same coloring and texturing. One thing I forgot to mention is that I used bitty pearls for the inside of the flower on the cover. I couldn't think of a more fitting gift for my Rose Blossom team members! It is beautiful and I feel blessed to have received one of these! Thank you Brenda!! Love it! and it is even prettier in person I must say. Thank you Brenda!